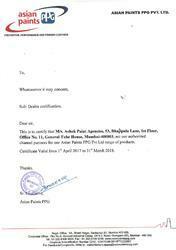 We, Ashok Paint Agencies entered the market in the year of 1994 as a partnership firm at Mumbai, Maharashtra (India), more than 50 years of experienced in the industry with the excellent support of our dexterous professionals and commitment to superior quality. We are well known supplier, wholesaler, distributor and trader a range of Paints & Thinners. We have now gained an undisputed position in the sphere of supplying and distributing best in industrial and decorative range of Paints like Epoxy Paints, Epoxy Primers, Inorganic Zinc Silicate, Solventless Epoxy Coatings, Tank Liner Coatings, HR Zinc Dust Graphite, Primers and Thinners. Our range comprises Epoxy MIO Coating, Polyurethane Paints, High Temperature Silicone Aluminium Paint, Chlorinated Rubber Paints, Chimney and Boiler Paints for exterior interior use and Premium Synthetic Enamel Paint like Apcolite. In addition, our broad range comprises superlative quality of Interior and exterior Acrylic Emulsion Paints like Royal, Velvet touch, Luxol Silk, Apex Ultima, Weather Coat all guard, Superlac Acrylic Emulsion, Luxol High Gloss, Superlac High Gloss, General Purpose Enamel Paints, Decorative Paints, Thinners and Red Oxide, Zinc Chromate & Zinc Phosphate Primer. RAL Shades in all range of products is our specialty. The offered range is specifically procured from some of the well recognized vendors of the industry who make use of accurate blend of optimum grade ingredients during the formulation of the range. Featuring characteristics such as eco friendliness, optimum coverage, resistance against moisture, heat, chemical & corrosion, high gloss, smooth finishing and various others. These products finds their extensive application for decorative finish of various establishments, coating of wood & metal products, construction equipment, engineering and automotive parts and many more. To cater to the ever increasing demands of our clients and strengthen our pole position in this competitive market, we have established cordial relation with foremost vendors of the industry. Empowered by a team of expert professionals and sound manufacturing facilities, our vendors aid us in offering superlative products that are formulated in strict compliance with industry laid norms and standards. The high production capacity of their manufacturing divisions enables us in meeting even the voluminous demands of the clients with utmost ease. Further, we are backed by a team of expert professionals, which works in close coordination with clients so as to thoroughly understand their varied requirements and offer them products accordingly. We have also developed a strategically located warehousing facility, which assists us in storing the range with utmost safety under favorable conditions. Moreover, its well connectivity with major transportation modes and efforts of our logistics professionals aid us in ensuring time lined delivery of each consignment. Under the aegis of our mentors, ‘Mr. Vipul Sanghavi’ and ‘Mr Ashok Sanghavi’, we have been able to carve a niche for ourselves in the domain. Their rich industry experience and sharp business acumen has helped us in garnering huge client base across the nation. Trading of Paints and Thinners. 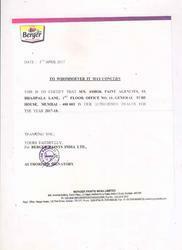 Authorized dealer of Berger Paints. 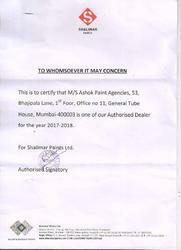 Authorized Dealer of SHALIMAR Paints. To promote a profitable and sustainable business activity through right sourcing and supply chain solutions. To offer prompt and effective services and project based competitive price. To apply right technology to safeguard the environment through end-to-end solutions. 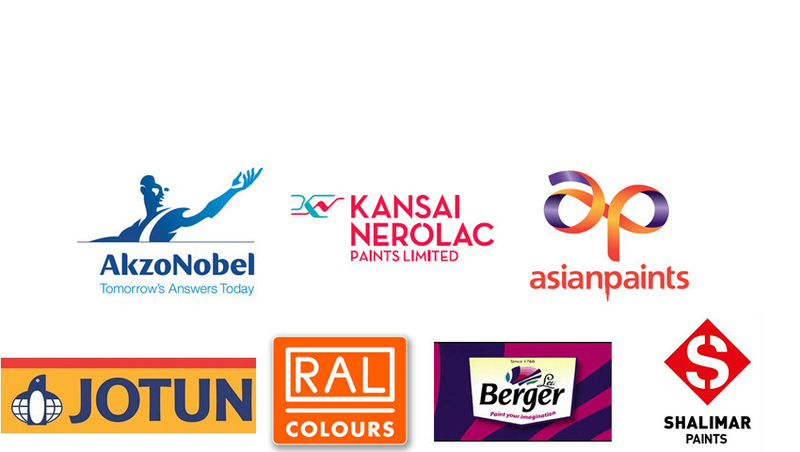 Authorized Distributor of ASIAN Paints. We are backed by a team of expert professionals, who work in close coordination with clients so as to thoroughly understand their varied requirements and offer them the right products. The pool of avid professionals has gained rich experience and immense expertise by serving varied segments of the paint industry. We have also developed a strategically-located warehousing facility, which assists us in storing the range utmost safety under favorable conditions. To remain at the forefront in this competitive market, we have established strong bonds with some of the noteworthy vendors of the industry. These vendors incorporate cost effective and advanced production methods so that we can offer products at reasonable prices within stipulated timeframes. Our Vision: “To retain leadership in the field of anti-corrosive paints by providing end-to-end solutions to clients through best quality practices and relentless pursuit of innovation.” Empowered by a team of expert professionals and sound manufacturing facilities, our vendors aid us in offering superlative products that are formulated in strict compliance with industry laid norms. Also, the high production capacity of their manufacturing divisions enables us in meeting even the voluminous demands of the clients with utmost ease. This is why we’ve emerged as a leading player in the vast marketplace. Our Primary Objective: “To promote a profitable and sustainable business activity through right sourcing and supply chain solutions”. Clients appreciate our intention to offer prompt services at competitive prices. For the last 20+ years, our products are being used extensively in India’s vast corporate, private and educational sectors for various applications. We are a client-centric organisation that believes in sustaining long term bonds with the clients. Owing to superior quality products and ethical business policies, we have garnered a huge clientele.